Then the angel showed me a river of the water of life, as clear as crystal, flowing from the throne of God and of the Lamb down the middle of the main street of the city. On either side of the river stood a tree of life, producing twelve kinds of fruit and yielding a fresh crop for each month. And the leaves of the tree are for the healing of the nations... And there will no longer be any night; and they [d]will not have need of the light of a lamp nor the light of the sun, because the Lord God will illumine them; and they will reign forever and ever. ...and before the throne there was something like a sea of glass, like crystal; and in the [c]center and around the throne, four living creatures full of eyes in front and behind. 7 The first creature was like a lion, and the second creature like a calf, and the third creature had a face like that of a man, and the fourth creature was like a flying eagle. In the Egyptian Book of the Dead when the sun god enters the netherworld he brings light("Illumines") and raises the dead there. The dead are then judged by Osiris who sits on a throne that has water flowing under it. In the photo below you'll notice under the throne is blue with wavy lines which indicates water. You'll notice coming out of the water is a lotus flower(represents resurrection) with four beings standing on the flower. 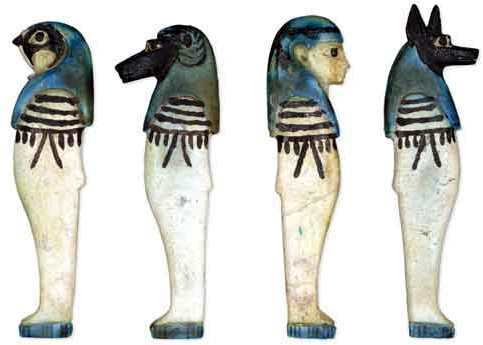 These four beings are known as the sons of Horus. Three of them were often portrayed as having the heads of animals while one of them had the head of a man. One has the head of an Eagle, one the head of a baboon(which resembles a lion in the picture), and the other the head of a Jackal(which resembles a calf in the picture). When the dead first enter the netherworld they are given food from the Tree of Life by the Goddess Nut. Last edited by nightshadetwine on Tue Sep 04, 2018 4:06 pm, edited 3 times in total. In this chapter of Revelation we are given measurements of the Heavenly Jerusalem and told that the walls are made of Jasper. Jasper is usually red due to iron inclusions. 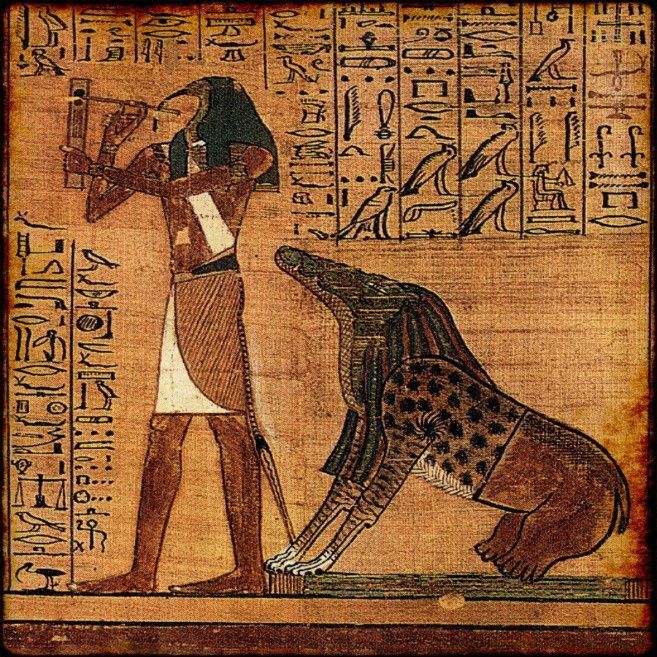 In the Book Of the Dead we are given measurements of the Field of Reeds which is the heavenly version of the lands surrounding the Nile where the deceased go after judgement. The Field of Reeds had walls made of Iron. Myths sometimes say that Apep was trapped there, because he had been the previous chief god overthrown by Ra, or because he was evil and had been imprisoned. Then I saw an angel coming down from heaven with the key to the Abyss, holding in his hand a great chain. 2He seized the dragon, the ancient serpent who is the devil and Satan, and bound him for a thousand years. 3And he threw him into the Abyss, shut it, and sealed it over him, so that he could not deceive the nations until the thousand years were complete." Then I saw a great white throne and the One seated on it. The earth and the heavens fled from His presence, and no place was found for them. 12And I saw the dead, great and small, standing before the throne. And there were open books, and one of them was the book of life. And the dead were judged according to their deeds, as recorded in the books. 13The sea gave up its dead, and Death and Hades gave up their dead, and each one was judged according to his deeds. 14Then Death and Hades were thrown into the lake of fire. This is the second death—the lake of fire. 15And if anyone was found whose name was not written in the book of life, he was thrown into the lake of fire. During the judgement the deceased hopes that his/her name is "called out" or "found on the board of offerings". In the picture below the god Thoth records the judgement. The beast behind him eats the soul of the deceased if he doesn't pass the judgement. Osiris sitting on his throne is cut off from the picture. Actually these symbols are ancient throughout the region. The sons of Horus are clearly the oldest, so Ezekiel would have borrowed. Christianity, as it replaced Paganism in the Roman Empire, no doubt would have chosen familiar symbols seen by those people. Of course the Church Fathers would suggest Ezekiel as a source (officially claiming no synchronism with Pagans). But if you look around at the symbols of temples and synagogues you just don't find many of these from Ezekiel. But the sons of Horus are visible in Art work and common culture. In this case, Ezekiel looks more like a flimsy cover story. I have zero problem with Ezekiel having borrowed his animal imagery from ancient symbols (probably Babylonian). And the Christian authors are supposed to have turned these four into a human, a calf, a lion, and an eagle independently of Ezekiel and the apocalypse of John? No way. It makes no difference at all that Ezekiel might not be well represented in synagogue murals or whatnot: Christians had his text, and they had the text of the apocalypse. Every church father of whom I am aware who speaks to the gospel symbolism (Irenaeus, Victorinus, Jerome, pseudo-Athanasius, Augustine) specifically mentions either the living creatures from Ezekiel or the four creatures from John (or both) in the same context. Are there any who do not? In other words, we are not talking about a situation in which there are four symbols in the earliest authors and then four symbols linked with scriptural texts in the later authors; the scriptural texts are there right from the start, so far as we can tell. Or are you suggesting that the symbols of the four gospels were originally a human, a baboon, a jackal, and a falcon, and that the church fathers used scripture to transform them? If so, what is your evidence of this earlier state of affairs? Last edited by Ben C. Smith on Thu Sep 06, 2018 8:59 am, edited 1 time in total. The "four fixed signs" of the zodiac seem a closer fit than the sons of Horus, at any rate (Taurus/bull = the calf; Leo/lion = the lion; Aquarius/waterbearer = the human; the only mismatch is Scorpio/scorpion = the eagle). Cherubim (or cherub in the singular form) are winged creatures that appear as attendants to God in the Jewish, Christian, and Islamic traditions. Their main duties are to praise God and to support his throne, though their roles vary from culture to culture...Whatever the origin of the name, the cherub itself can be traced to mythologies of the Babylonians, Assyrians, and other peoples of the ancient Near East. In these cultures, cherubim were usually pictured as creatures with parts of four animals: the head of a bull, the wings of an eagle, the feet of a lion, and the tail of a serpent. The four animals represented the four seasons, the four cardinal directions (north, south, east, and west), and the four ancient elements (earth, air, fire, and water). The earliest reference to the sons of Horus the Elder is found in the Pyramid Texts where they are described as friends of the king, as they assist the king in his ascension to heaven in the eastern sky by means of ladders...The sons of Horus also became associated with the cardinal compass points, so that Hapi was the north, Imsety the south, Duamutef the east and Qebehsenuef the west. Their brother was Ihy, son of Hathor. "These four gods, friends of the King, attend on this King, (namely) Imsety, Hapi, Duamutef, Khebhsenuf, the children of Horus of Khem; they tie the rope ladder for this King, they make firm the wooden ladder for this King, they cause the King to mount up to Kheprer when he comes into being in the eastern side of the sky." There seems to be other connections between the 4 sons of Horus and the 4 living creatures from ezekiel/revelation. The multiple strands and connections between the four elements, the four cardinal compass points, the four fixed zodiacal signs, and the 4 creatures (whether they be imagined as the sons of Horus or the living creatures from Ezekiel or Revelation) seem likely enough to me. I bet that kind of symbolism is ancient, rooted in cultural contexts that precede both Egypt and Babylon. So far so good. 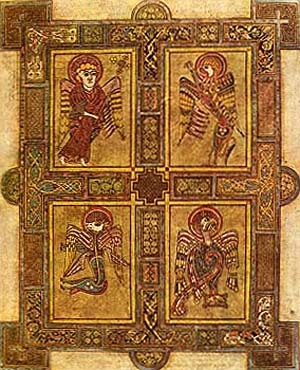 The issue arises on this thread, however, when one wishes to investigate the origins of the four gospel symbols (human, lion, calf, and eagle). Our earliest witness (by the usual chronologies, at least) for this symbolism is Irenaeus, and already Irenaeus is matching each gospel with a creature from Revelation 4.7. If there was a previous stage at which the gospels were given animal symbols which were not related either to Revelation 4.7 or Ezekiel 1.10, I would like to see the evidence for that stage.